Use iMediChart.com to organize your vital medical records online. It is fast, friendly, and secure. In case of emergency (ICE) it can save lives or reduce medical mistakes. Step 1: Sign up online or call 888-49-CHART. Step 2: Login in to add your vital medical information and receive your own iMediChart ICE health cards (wallet size and key tags). 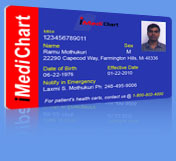 Step 3: Carry the iMediChart cards with you and present them in case of emergency (ICE) or Doctor office visits. The medical professionals treating you will be able to get some basic information from the cards and retrieve a lot more from our authenticated secure server 24 hours a day. Having access to timely information could help protect yourself from medical mistakes and save your life. It's simple, fast, easy, and inexpensive. Why wait. Copyright © 2009 eMedLogic, Inc. All rights reserved.